Have you ever thought of creating an application for a connected device? As simple as putting on your lights at home, before even you arrive or allowing a guest to enter your house, while you are away or preventing any form of intrusion inside your house, when you are not there. 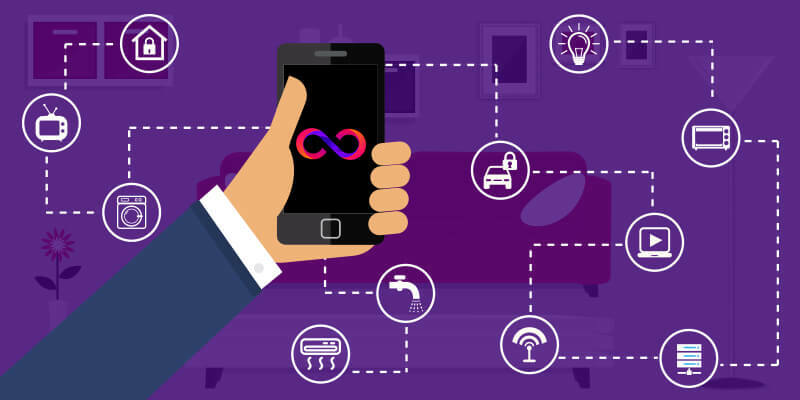 We at Appinventiv, are taking recourse to mobile app development for the Internet of Things (IoT), in a variety of applications, particularly for the Home and Office Automation space. We would like to inspire some of our collected experience in the IoT space, and involve in the entire scope of the app development process. We believe that it should be a lot easier for everyone to hook up to mobile phones and tablets to connected devices than it is today. We don’t want that our every developer back to school on the inner workings of Objective-C and Android Java. However, we know how important native development is. And, that’s why we aim to keep ourselves updated with the recent market trends. Our in-depth analysis, broader experimentation and prototyping enable us to deliver new services and simpler testing in real-time,understanding the requirements of our clients. We see a future internet of both people and things in harmony – and we know that mobiles will play a major role in it. Let’s discuss what we think needs to be done to achieve that. The starting point for building the IoT applications will be the things by themselves. The devices have no screen, a low-power processor, embedded operating system and a wireless way of communicating with using protocols. We first is the stage of conceptualizing towards understanding the requirements of the users and then form the goals for the entire app development process. Next, is the stage on wire-framing, so that a blueprint of the structure of the app is developed, making the app development process work in sync with the requirements. When it comes to mobile devices, it’s pretty much a debate to choose between iOS and Android rather than the 10+ competing operating system flavors which developers needed to take into account a decade ago. On the other hand, already covering all variations, implementations of subsystems, APIs and low-level methods are more than enough for a smaller team. So, the question is -how to make even more applications that can help in improving client’s lives. It’s all about tearing down the silos, or more diplomatically; find horizontal approaches where proprietary solutions are abstracted towards what you actually want to accomplish. Next, the user interface is designed and coding needs to be completed within a stipulated time frame. It’s about establishing generic code bases common to more than one operating system system. The prototype of the app that is developed will be sent to the client for approval at their end. The system providers who keep to themselves will eventually lose ground, even as they’re actually solving practical problems for their customers in the short term, as interoperability and standard will be increasingly important and silos increasingly expensive to maintain and develop further. And the sooner we find ways to effectively promote format neutrality for data and security from sensors to users, in order to look for common protocols and tools that work across the plethora of handhelds and other single-code base examples. We would like to take the opportunity to stick our heads out a bit. We don’t think its more research, more analytic’s, additional planning, hiring consultants or talk that will create the first services and applications for your clients, it’s more about expertise. It’s making simple application experiments, and adding a mobile channel to one of your existing offerings. The process of app development does not stop where the app is submitted to the App Store, but also have a healthy marketing strategy for promoting the app in the social media platforms.